Will an inheritance bring new happiness or a trap for murder? Bad luck seems to follow Sam Blacker. She loses her job and faces daily struggles keeping her drunken neighbor away from her. When an unexpected inheritance gives her a chance for a new beginning, Sam, a city girl at heart, is hesitant. However, after a brutal attack she has no choice. 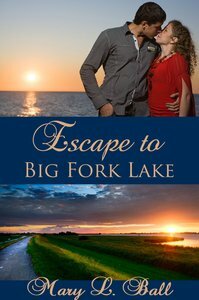 Making a decision that will forever change her life she flees to the small fishing town of Big Fork Lake, Alabama and soon finds herself in the arms of Noah Frye. A tumultuous relationship with Noah sparks buried desires of the heart, even if he is a Christian, surely, she can get around that little problem. As Sam and Noah's passion grows trouble lurks in the shadows, waiting and watching. Inescapable, Sam's bad luck returns when she stumbles upon a murder and becomes the only suspect. Will she have to run again, this time to stay out of prison? Worse, will she lose the best man she's ever found? And what about the newfound hunger in heart to know God--can she truly trust in Him? About "Escape to Big Fork Lake"